After traveling many different places, we realized that we are losing our essence, imprisoned by this hectic world we live in. We decided to take inspiration from those who keep fighting to preserve their roots: the tribes. Ethnic Watches, a startup watch company inspired by tribes around the world, launches today on Kickstarter with a funding goal of $12,347. Ethnic Watches uses Italian leather and unique textile straps to set their watches apart from other luxury watch companies. Ethnic Watches offers luxury features such as Swiss Ronda 562 movement, sapphire anti-scratch crystal, 316L stainless steel, a Sony battery, 5 ATM and Italian vegetable tanned leather with hand-cut ethnic textile. All of the watches are backed by a 10-year warranty. Inspired by those preserving their roots, Ethnic Watches uses designs based upon tribes around the globe, which express themselves through vibrant colors and their values as a community. 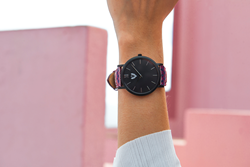 In the future, Ethnic Watches plans to donate 5% of future funds raised to the NGO’s Survival International and Kubuka organizations in hopes of helping form bonds with indigenous people while purchasing their tribal textiles. Become part of the Ethnic Watches community for a discounted price of $99 on Kickstarter. To learn more about Ethnic Watches, visit bit.ly/EthnicWatchesKS.